Everybody seemed to regard everything as a deity back in the day, and bees are no exceptions. The queen bee was looked upon as a manifestation or symbol of the “Goddess” in the ancient world, in Ancient Sumer, Minoan Crete, Spain, Egypt, and of course, Greece. Cave paintings and temple carvings in the ancient world implied as much, that the humble bee was worshipped for thousands of years. More than one deity was also said to have tears made of bees–talking about you Norse Freya and Egyptian RA! 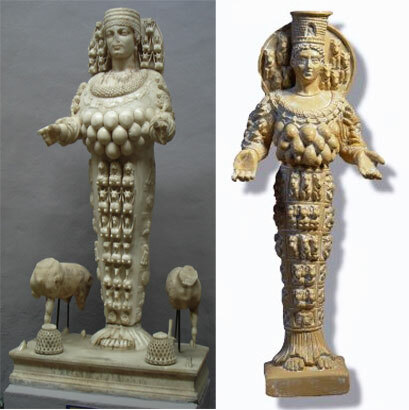 And don’t these statues of Artemis look like they hive beehive tiaras, too? In ancient religious sites you can find an Omphalos, a structure shaped like a beehive. Arguably the most famous Omphalos was the one found at Delphi, whose priestesses were said to be called Melissae which means–you guessed it–bees. The ancient ones were probably smarter than us for realizing just how important bees are. In recent years, trivia links have circulated how if bees go extinct, we humans would be next in line. This might be a bit too apocalyptic, but it’s not very far-fetched. It definitely would reduce the crops that we rely on for food by more than half (since bees are Earth’s major pollinators). But when you think about it, if bees go extinct, the reason would probably be the world running out of flowers. Perhaps because at that time, our planet has become highly polluted flowers can’t even survive. By then, it’s either we sign up for Asgardia or maybe we humans should just figure out how to save the environment (and our species) now. Asgardia does sound cool though. Ready to be a citizen of the first space nation? You could so easily sign up (read: it’s free)!